Keen Smell. The rad-rat pup has advantage on Wisdom (Perception) checks that rely on smell. Bite. Melee weapon attack: +5 to hit, reach 5 ft., one target. Hit: 1 piercing damage, and the target must make a DC 10 Constitution saving throw. On a failed save the target contracts waste plague. On a successful save the creature resists the disease, and cannot be infected again by this rad-rat until 24 hours have passed. Keen Smell. The mangy rad-rat pup has advantage on Wisdom (Perception) checks that rely on smell. Bite. Melee weapon attack: +5 to hit, reach 5 ft., one target. Hit: 1 piercing damage, and the target must make a DC 10 Constitution saving throw. On a failed save the target takes 5 (2d4) poison damage, gains the poisoned condition for 1 minute, and contracts waste plague. On a successful save the creature takes half damage and resists the disease, and cannot be infected again by this rad-rat until 24 hours have passed. A creature poisoned by the infected rad-rat pup’s bite can repeat its Constitution saving throw at the end of each of its turns, ending the poisoned condition on a success. Keen Smell. The rad-rat has advantage on Wisdom (Perception) checks that rely on smell. Multiattack. The rad-rat makes two attacks. Bite. Melee weapon attack: +6 to hit, reach 5 ft., one target. Hit: 5 (1d4 + 3) piercing damage, and the target must make a DC 11 Constitution saving throw. On a failed save the target contracts waste plague. On a successful save the creature resists the disease, and cannot be infected again by this rad-rat until 24 hours have passed. Keen Smell. The mangy rad-rat has advantage on Wisdom (Perception) checks that rely on smell. Multiattack. The rad-rat makes three attacks. Keen Smell. The infected rad-rat has advantage on Wisdom (Perception) checks that rely on smell. Bite. Melee weapon attack: +6 to hit, reach 5 ft., one target. Hit: 5 (1d4 + 3) piercing damage, and the target must make a DC 11 Constitution saving throw. On a failed save the target takes 9 (2d8) poison damage, gains the poisoned condition for 1 minute, and contracts waste plague. On a successful save the creature takes half damage and resists the disease, and cannot be infected again by this rad-rat until 24 hours have passed. 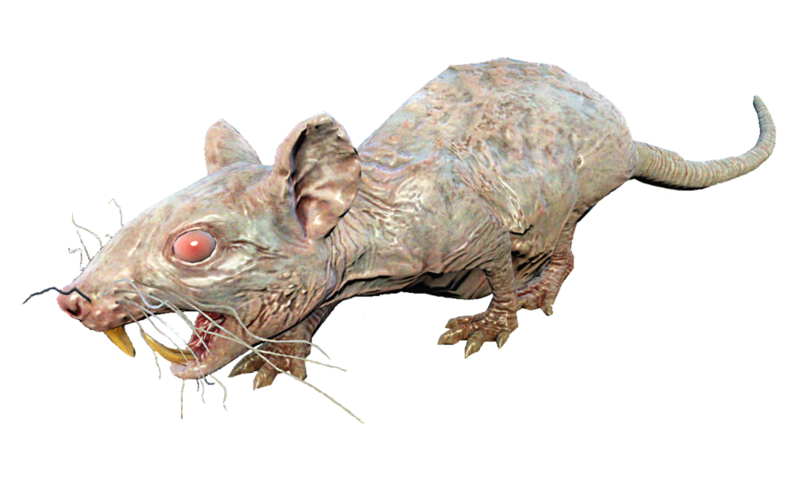 A creature poisoned by the infected rad-rat’s bite can repeat its Constitution saving throw at the end of each of its turns, ending the poisoned condition on a success. Keen Smell. The plagued rad-rat has advantage on Wisdom (Perception) checks that rely on smell. Multiattack. The rad-rat makes four attacks. Bite. Melee weapon attack: +7 to hit, reach 5 ft., one target. Hit: 5 (1d4 + 3) piercing damage, nd the target must make a DC 12 Constitution saving throw. On a failed save the target takes 10 (4d4) poison damage, gains the poisoned condition for 1 minute, and contracts waste plague. On a successful save the creature takes half damage and resists the disease, and cannot be infected again by this rad-rat until 24 hours have passed. A creature poisoned by the plagued rad-rat’s bite can repeat its Constitution saving throw at the end of each of its turns, ending the poisoned condition on a success.